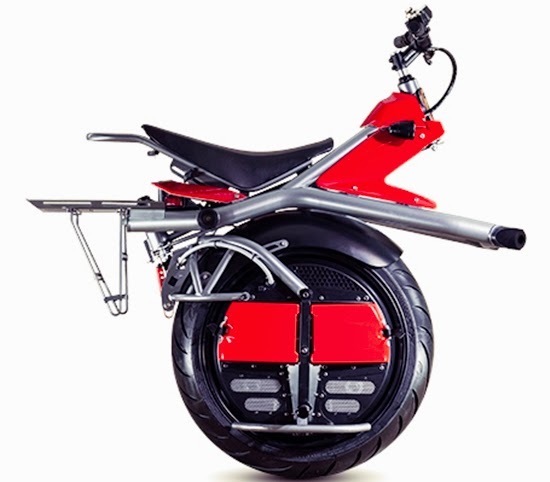 Motorcycle with one wheel used a self-balancing technology that provides balance to the motor. Ryno bikers like a professional circus performer who is able to run this one-wheeled motorcycle with full balance. With a self-balancing technology, according to its inventor, Ryno motorist is unlikely to fall. Self-balancing technologies is useful in stabilizing and uphold the vehicle automatically, if the rider is too lean forward or backward, or was too tilted to the left and to the right. This motor is named Ryno with the one wheel that is driven by electricity. This motor is capable of operating at a maximum speed of up to 10 miles per hour (16 kph). 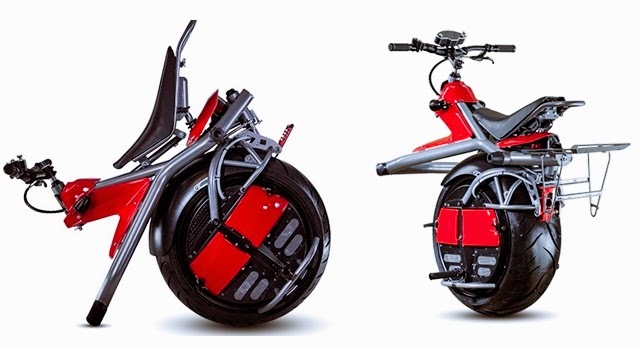 This one wheel motorcycle, designed in order to be used in various urban terrain, with a sleek design allows the user to slide on the sidewalk or pedestrian area and next to the shops. Because it uses only one wheel, this bike is not so filled the space or the road, could even get into the apartment lobby and fit into the elevator. Ryno Motors is using two SLA batteries with high output that can be used up to 10 miles round trip. There is also an option with Lithium Ion batteries. The battery can be separated to facilitate the charging by connecting it to a power outlet. It only takes about a half hour (90 minutes) to fully charge the battery Ryno. The front of the vehicle is equipped with a 12 V DC power that can be used to charge smartphones, such as those found in generally car. 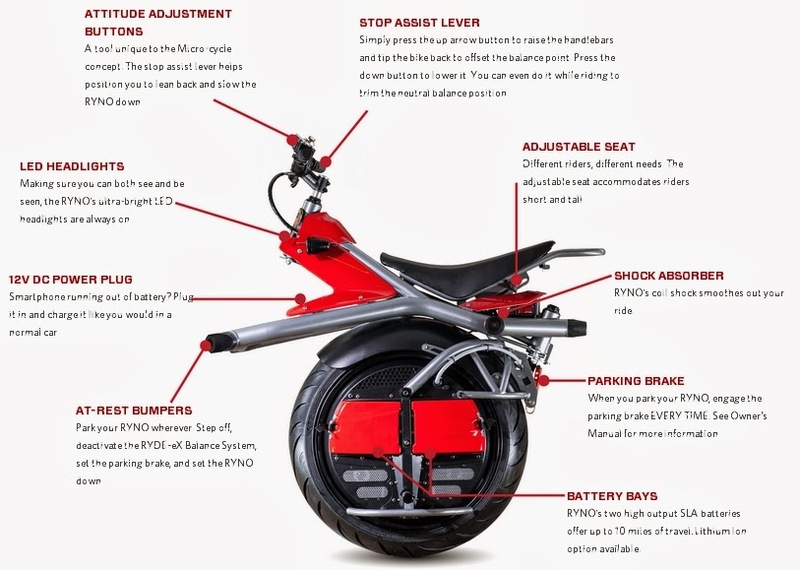 To be able use this Ryno motors, it takes time to learn at least one hour, and you will be the riders who have skills like a professional circus performer, Because it is supported by the self-balancing technology, which makes it easy for the rider to be able to drive a motorcycle with one wheel. Ryno motors using "motion-sensor technology" that is sophisticated sensors that can detect very subtle movements by users. Motion-sensor technology is used to control the speed of motor Ryno. When the body of the rider leans forward, it will accelerate the pace of Ryno's vehicle. Ryno Motors weight is 57kg, with a capacity of 260 lbs (£ 260)for cargo. Ryno Motors is a motorcycle made in USA, All Ryno Micro-cycle built and assembled in Beaverton, Oregon, using high quality materials and components. "Article : Motorcycle with one wheel equipped with a self-balancing technology, So that motorists are not likely to fall"